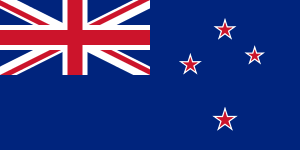 The Realm of New Zealand is the entire area (or realm) in which the Queen of New Zealand is head of state. New Zealand is an independent, sovereign state. It has one Antarctic territorial claim, the Ross Dependency; one dependent territory, Tokelau; and two associated states, the Cook Islands and Niue. The King/Queen of New Zealand, represented by the Governor-General of New Zealand, is head of state throughout the Realm of New Zealand. The exact scope of the realm is defined by the 1983 Letters Patent constituting the office of Governor-General. It constitutes one of 16 realms within the Commonwealth. The Cook Islands and Niue became New Zealand's first Pacific colonies in 1901 and then protectorates. From 1965 the Cooks were self-governing; so was Niue from 1974. Tokelau came under New Zealand control in 1925 and remains a non-self-governing territory. ↑ The current New Zealand Parliament is unicameral with its sole chamber House of Representatives. 1 2 The Governor General of New Zealand is also the Representative of the Queen of Niue and the Governor of the Ross Dependency, but they are separate posts. ↑ Legislation for the Ross Dependency is enacted by the New Zealand Parliament (House of Representatives) although actually, its powers are limited due to the Antarctic Treaty System. A governor-general represents the head of state (Elizabeth II, in her capacity as Queen of New Zealand) in the area of the realm. Essentially, Governors-General take on all the dignities and reserve powers of the head of state. From 31 August 2011 until 31 August 2016 the Governor-General was Rt Hon Sir Jerry Mateparae. Dame Patsy Reddy was appointed to assume the position on 14 September 2016. The Realm of New Zealand is not a federation or a unitary sovereign state; it is a collection of states and territories united under a monarch. Both the Cook Islands and Niue are self-governing states in free association with New Zealand. The details of their free association arrangement are contained in several documents, such as their respective constitutions, the 1983 Exchange of Letters between the governments of New Zealand and the Cook Islands, and the 2001 Joint Centenary Declaration. As such, the Parliament of New Zealand is not empowered to unilaterally pass legislation in respect of these states. In foreign affairs and defence issues New Zealand acts on behalf of these countries, but only with their advice and consent. According to Niue's Constitution of 1974, the Governor-General of New Zealand acts as the Queen's representative. In the Cook Islands and Niue the New Zealand High Commissioner is the diplomatic representative from New Zealand. John Carter (since 2011) is the New Zealand High Commissioner to the Cook Islands. Mark Blumsky was the New Zealand High Commissioner to Niue from 2010 until he was replaced by Ross Ardern in early 2014. Tokelau has a lesser degree of independence than the Cook Islands and Niue, and had been moving toward free association status. New Zealand's representative in Tokelau is the Administrator of Tokelau and has the power to overturn rules passed by the Parliament of Tokelau. In referenda conducted in 2006 and 2007 by New Zealand at the United Nations' request, the people of Tokelau failed to reach the two-thirds majority necessary to attain a system of governance with equal powers to that of Niue and the Cook Islands. Pitcairn Islands – though not part of its realm, New Zealand is involved in several aspects of Pitcairn governance, such as law enforcement and the Pitcairn Supreme Court. The British High Commissioner to New Zealand is de jure Governor of Pitcairn. ↑ Taonga, New Zealand Ministry for Culture and Heritage Te Manatu. "Pacific Islands and New Zealand – Te Ara Encyclopedia of New Zealand". The Encyclopedia of New Zealand. Retrieved 22 November 2016. ↑ Hare, McLintock, Alexander; Wellington., Ralph Hudson Wheeler, M.A., Senior Lecturer in Geography, Victoria University of; Taonga, New Zealand Ministry for Culture and Heritage Te Manatu (1966). "The Ross Dependency". Encyclopedia of New Zealand. Retrieved 22 November 2016. ↑ "Check if you're a New Zealand citizen". New Zealand Department of Internal Affairs. Retrieved 20 January 2015. ↑ "Tokelau decolonisation high on agenda". The New Zealand Herald. NZPA. 17 May 2008. Retrieved 23 November 2011. ↑ A July 2005 poll published in The Press showed 27% support for the question "Do you support New Zealand becoming a republic? ", and 67% opposition. ↑ A Sunday Star-Times poll, published 20 January 2006, stated there was 47% support for a New Zealand republic, and 47% support for the monarchy. 1 2 Townend, Andrew (2003). "The Strange Death of the Realm of New Zealand: The Implications of a New Zealand Republic for the Cook Islands and Niue". Victoria University of Wellington Law Review. Retrieved 25 July 2010.